aaron sterns » My First Newspaper Interview! The outback serial killer Mick Taylor is to return to movie screens in a sequel of the blood-soaked Australian cult horror film Wolf Creek, as well as a series of novels. With its shades of the backpacker murders, Wolf Creek 2 leaps eight years after the events of the original film to find Taylor – played by John Jarratt – preying on foreign visitors who have the misfortune to turn up in the wrong place at the wrong time. The film premiered at the Venice Film Festival and is to be released in Australian cinemas on February 20. Now two new novels are to be published by Penguin in January which build the back story to Taylor’s violent rages, taking fans back to the time he is a scrawny jackaroo at a remote Western Australian sheep station, struggling with the memory of his little sister’s grisly death. 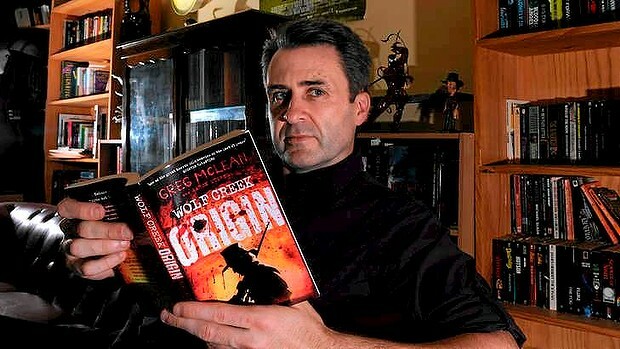 Film director Greg McLean and Wolf Creek 2’s co-writer Aaron Sterns have written Wolf Creek: Origin, the first in Penguin’s planned series of six print and digital novels. Origin will answer the question about where did Taylor’s murderous intent begin, if these events inured the character to the death of others, or primed him to seek pleasure from murder. ”It’s an age-old question about serial killers and goes to the heart of this most Australian of horror villains,” Sterns says. Desolation Game, the second instalment to be published alongside Origin, has been written by McLean and horror author Brett McBean. This time Taylor, back from the Vietnam War, turns his killer impulse on a Kombi-load of sightseers. Four other e-books will be commissioned from the best horror writers in the country. Drawing on the disappearance of British tourist Peter Falconio and the Ivan Milat backpacker murders, Wolf Creek was banned in the Northern Territory in 2005, the year of its release, during the trial of Falconio’s killer, Bradley Murdoch. Sterns says part of Wolf Creek’s original appeal lies in how it captures the inherent fear Australians have of the outback. Jarrett’s characterisation of Mick Taylor struck such a chord because he embodied the laconic, jokey Australian everyman, an exaggeration of Mick Dundee, says Sterns. ”But there’s a flipside to the casual sarcasm and tall poppy-chopping that Australians are fond of because Mick sees weakness in those unsuited to Australia, and views those who encroach on his territory — tourists and city slickers — as vermin. Many thanks go to Mark Smith-Briggs, President of the AHWA, for helping to set this up. Huge work Mark. Aaron, congratulations on the latest project – hope it’s a success. Thankyou Dave. A lot of blood, sweat and tears have gone into the book (mostly figurative). Here’s hoping it was all worth it! No worries. This is ‘old mate’ Dave by the way of Deakin Uni gym spotting fame, circa mid 90s! I’m working for the dark side now (PR). Good to see you followed your literary ambitions. Heya Dave. Yes, have pursued the writing all these years. Funny how I’m going to have two things hitting at once now. Hopefully 2014’s a big year.